Watch any Drum Corps International event, and you'll witness some of the most intense, precise and dramatic performances on the planet. The scintillating shows are the product of great players, arrangers and educators who work together to wring every drop of excellence out of the performances. Now Drum Corps International has created a new division, "OnQ Performance Education," to give students and teachers the opportunity to tap into the expertise and talent that makes Drum Corps International the pinnacle of marching music. The program is designed to reach students of all ages in several ways: online, through instructional materials and interactive teaching; live, via one-day and multi-day instructional camps produced in conjunction with DCI events; and through books, DVDs and other media products. The OnQ performance education division will feature "the top talent within the ranks of Drum Corps International's elite corps," says OnQ Executive Director Gary Doherty. Previously a music educator in Texas for 28 years, Doherty has served the ranks of middle school and high school bands, and will now put his advanced degrees in education and educational leadership to additional use heading up OnQ initiatives. 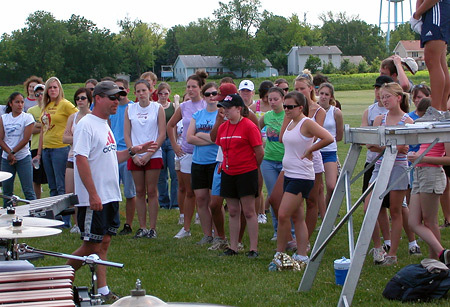 In the past, individual drum corps have provided a variety of music "clinics" and various other educational outreach offerings. OnQ will utilize "a custom-designed curriculum focused on the needs of students and educators alike," Doherty continued. The initial curriculum will emphasize "specializations found in our competitive drum corps such as brass, percussion, guard, dance, leadership and drum majoring, plus fitness and conditioning." Through the recently established relationship between Drum Corps International and MENC, The National Association for Music Education, a select committee of MENC members is being created to advise OnQ on the establishment of educational standards governing curriculum and events. The OnQ program has been several years in the making. "It grew from the realization that each drum corps is comprised of dedicated and highly qualified instructional staff and energetic marching members who are able to seize an opportunity to provide a broader range of services to students and music educators around the world," Doherty explains. DCI saw a need for advanced instructional models for students around the country, as well as increased access to these world-class designers and instructors. "DCI saw a need for advanced instructional models for students around the country, as well as increased access to these world-class designers and instructors. Many of the corps staff members are full-time band directors in the off-season and bring with them a wealth of experience." The OnQ network has officially launched, and will be a continuously-evolving work-in-progress. Current projects in development include a dedicated Web site and a full spectrum of instructional materials, including DVDs, online video/audio, and very robust and impressive interactive technology. Doherty says that OnQ will work in partnership with some of the biggest names in music and performance education. The interactive technology will be a key component in future offerings of the new program. According to Doherty, "a trumpet player, for example, might play a passage, upload it to the Internet, and get a critique online from a DCI instructor." An online community for the sharing of information will also serve as an important part of the OnQ experience. In addition to the Internet-based programs, OnQ instructors will begin working directly with students and teachers at live learning events, beginning next summer. 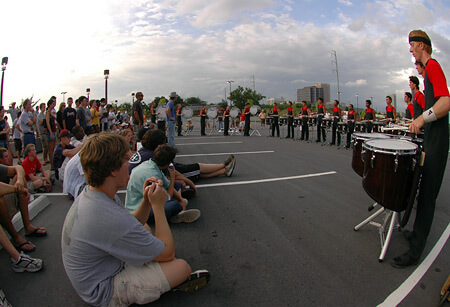 The learning events will include classroom instruction and demonstration performances by top drum corps, and will offer students a chance to perform with the corps members. "It will be like a "fantasy" experience, where students can drum with corps like the Blue Devils and perform in front of thousands of fans," Doherty says. Event information and registration will be offered through the OnQ Web site, onq.org. Doherty stresses that each corps and instructor will bring its own "unique perspective" to the unified curriculum. "This means that each student will leave our events, no matter where they attend, with the same tools and experiences, [but] delivered in a unique manner." Over time, additional specialists will be engaged to expand OnQ's offerings into other performance areas. "Eventually, OnQ will offer instruction and materials for the full range of musical instruments, included in a full year-round scholastic cycle," Doherty says. "With a vision this broad, it will take time to bring all of this to completion." With the launch of this new educational initiative, all DCI educational functions will be channeled through the OnQ Performance Education Division, including the ongoing Commitment to Excellence program. Those who will be attending the Midwest Clinic in Chicago, Dec. 19 through 21, can stop by the Drum Corps International booth to learn more about OnQ. Additionally, music educators are welcome to register to receive both the 2007 Commitment to Excellence DVD and information regarding OnQ's educational programs and products.